By keeping in its heart the biggest part of Modern Greek history, the chain of Mount Pindos offers unique scenery in Greece. A magnificent combination of trekking on cobblestone pavements and stone bridges, climbing in tracks that lead to the top of Smolikas at the altitude of 2637 meters (the second highest peak in Greece). 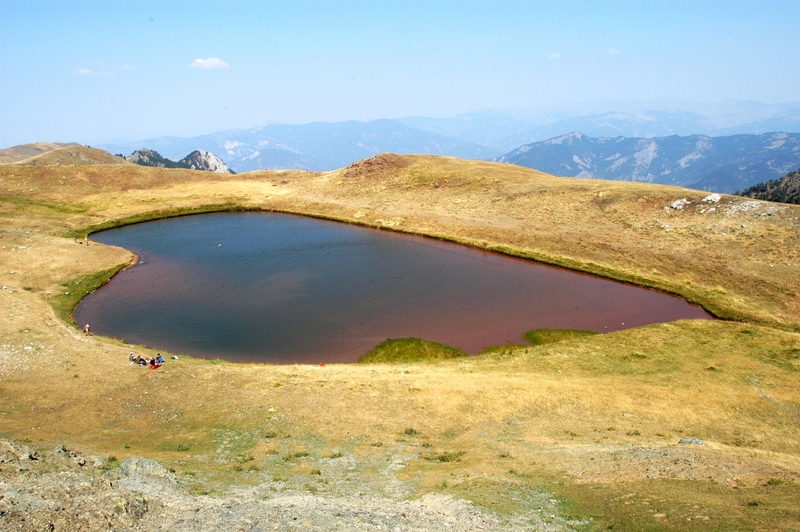 We will discover the beauty of nature by walking inside the national park of Valia Kalnta, the place of brown bears in north west Greece, and climbing on the peak of Flegga, watching the view over the lake and South Pindos. Your guide will meet you in the city of Ioannina. We will transfer you to the picturesque village of Tsepelovo in central Zagori. For those arriving at Corfu airport they will need a ferry crossing to Port Igoumenitsa, which takes 1 ½ hours and then continue to Tsepelovo. 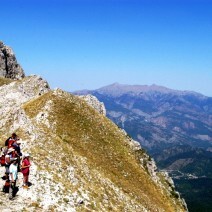 The hiking starts on a forest road for one hour and then we climb to the area called Diaselo Avalou ridge. From the balcony the view is truly amazing. We walk above the tree line on the open escarpment, and then descend into the forest to find a natural spring with fresh running water. The local people call the spring Neraidovrisi from the fairy tale lady. After the spring we follow the forest road and the path until the village of Vrisochori . Dinner and overnight stay in Vrisochori. Meals: Breakfast, Packed Lunch, Dinner. 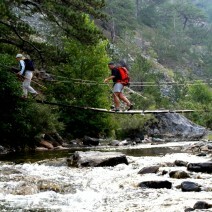 From the village of Vrisochori we descend to Aoos river via an old road that has been re laid over time. The river invites us to take a refreshing plunge and then we start to climb to the village of Pades through the forest road and paths. The perfect view of Mount Timfi accompanies us all day. Dinner and overnight stay in Pades. 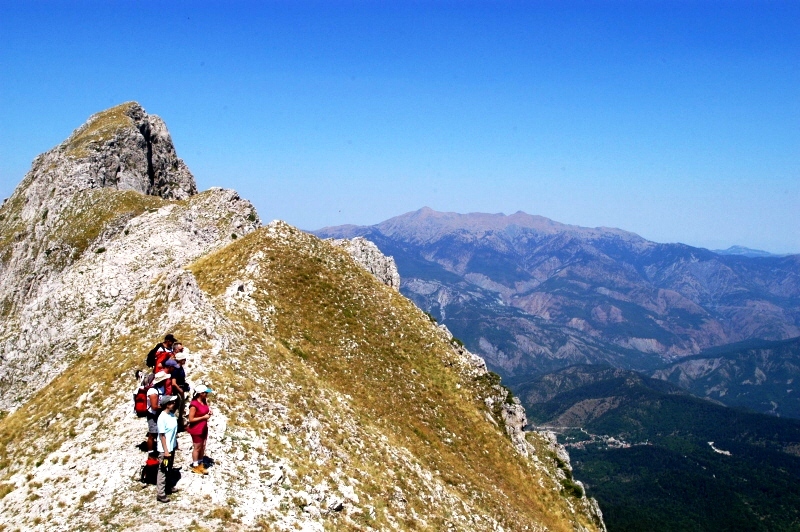 This is our second biggest day of trekking and we hike to the second peak of Greece at 2637m. 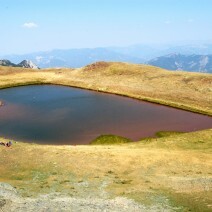 The brave ones amongst us can take a dip in Dragon Lake at 2100m just below the top. After the top we follow the ridge past the peak of Mossia and then we descend to the village of Samarina, most of the mountainous of Greece. Dinner and overnight stay in Samarina. As we leave the village of Samarina , we will follow the forest road at the beginning and then the national European walking path E6, through the breathtaking fauna and flora . As we walk we will see the mountains of Smolikas next to us and remind us how wondrous the glory of nature is. We will finish the day at the village of Distrato. Dinner and overnight stay in Distrato. The day begins with a small climb after we exit the village. After that we continue inside the National Park of Valia Kalnta. 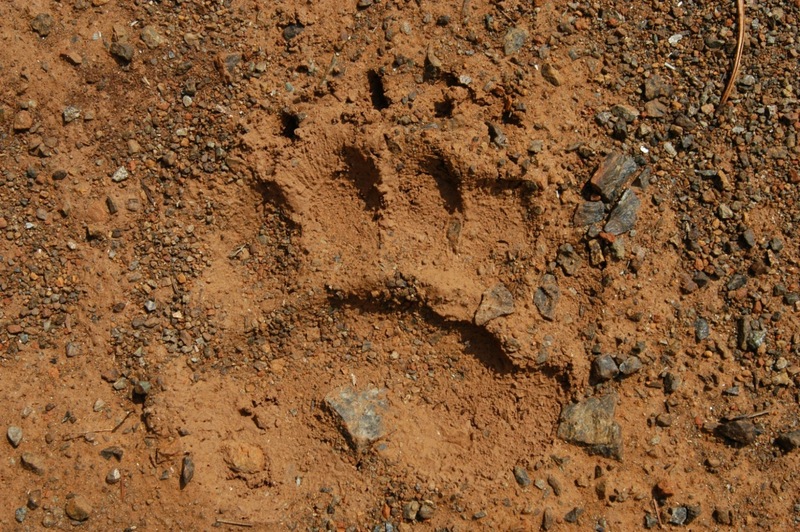 We will come across bear footprints and hope that we don’t meet the bear. By the end of the trekking we will walk at the forest road before we reach the village of Vovousa. Dinner and overnight stay in a private refuge in Vovousa. 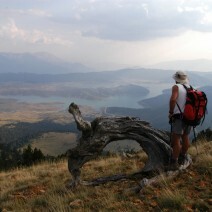 This is by far one of the best trekkings in Greece . 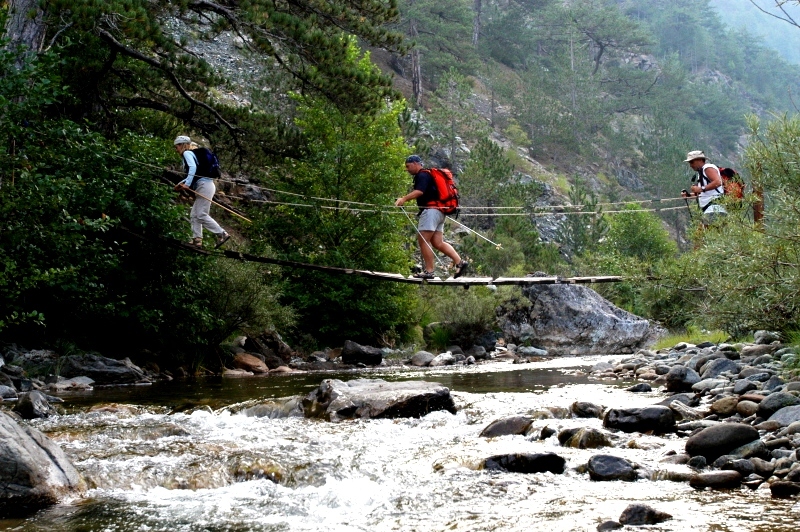 We are going to walk through the centre of the National Park, with its unspoilt fauna and flora. 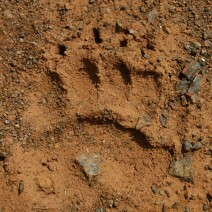 One of nature’s paradises to find wild animals. Here is the home of the brown bear which gives the name to the stream and of course the crystal water will invite us to jump in. 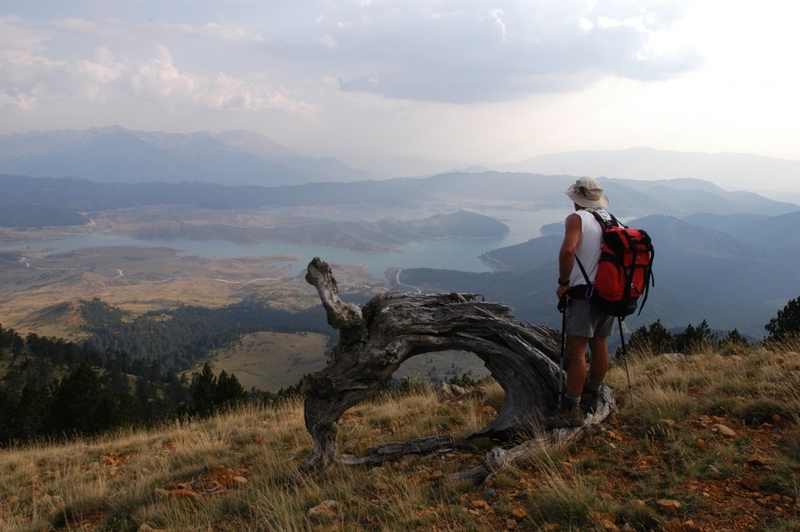 After that, the climb for the top of Flega rewards us with the magnificent view at the Lake of Aoos Springs. Our day finishes in the refuge of Maurovouni and from there we are collected and taken to the village of Metsovo. Dinner and overnight stay in Metsovo. Meals: Breakfast, Picknic Lunch, Dinner. After breakfast we transfer you to the city of Ioannina* (airport / hotel). 6 nights bed & breakfast in local guest houses, based on double rooms with en-suite shower/WC, air conditioning, TV, telephone and internet access. 1 night in Mountain refuge, in dormitories. TREKKING SHOES / BOOTS ARE NECESSARY! This tour is subject to change at the discretion of the tour leader, according to weather conditions or circumstances beyond our control. The refuge contains bunk beds, bed linen, pillows / pillow cases and blankets. There is also a restaurant, cold water showers and toilets. Guests are welcome to carry their own bed linen / sheets, for personal usage.